A nod to the iconic style of the 1960’s, Red/Rot/Rouge embodies the empowered feminine beauty that rose from the ashes of a World War that helped to shape a cultural decade of immense character and inspiration. This six piece collection pays tribute to the style of this decade by depicting six women from the period with a striking red undertone unifying each artwork. Registered postage and handling is included. 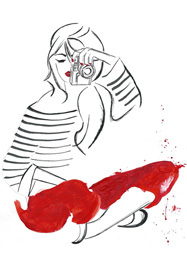 The woman in red will bring a touch of iconic, timeless style into any living or office space. 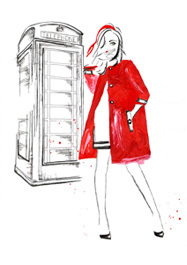 With her classic trench coat, the woman in red evokes an unmistakable mod-squad cool. 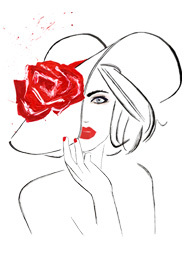 The woman in red will bring a burst of elegance and joyous optimism to your walls. 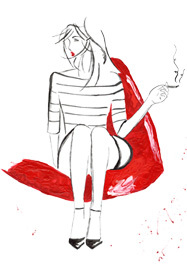 The woman in red evokes an old-world charm and unmistakable twist of glamour. 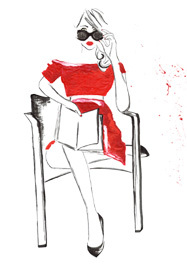 With her book placed nonchalantly in her lap, the woman in red is alluring. A candid portrait of the woman in red, her luscious lips & striking eyes a feature.